Las Vegas Sands Corp. $2.4 billion Venetian Macau resort grand opening. The opening of this resort will more than double the hotel and casino capacity in China. The expected result for building the Venetian is to change the travel from a day trip destination to a long term stay for all of Asia to experience. The 11 million square foot project has 3,000 rooms and opened yesterday. The Venetian Macau is the first resort on the Cotai Strip, reclaimed land minutes from downtown Macau. Future real estate projects include a total of 20,000 hotel rooms by Las Vegas Sands. The primary visitor to the Sands Macau caters to a short term or single day customer. The Venetian, designed after the Las Vegas resort on the Strip, includes a 15,000 seat sports arena, 1.2 million square foot convention center, upscale dining and 1 million square feet of retail. A Cirque du Soleil-produced show is scheduled to open in the spring. The grand opening was set to meet Fung Shui guidelines. The doors opened at the 500,000 square feet casino Tuesday, 4:18 am Las Vegas time, or 7:18 pm Macau time. There has been a lot of anticipation of the grand opening. With and expected 30,000 customers waiting for the doors to open. Next spring a Four Seasons luxury hotel with 400 rooms is expected to open next to the Venetian wit an additional 6,000 rooms within three sites by the end of 2008. In 2009, Las Vegas Sands expects to offer 6,000 more rooms in three hotels in Macau. The major casino growth in the next three years will create two different markets including downtown Macau and Cotai Strip. Downtown Macau includes Wynn Macau, soon to open MGM Grand Macau and the Sands Macau. Call 702-505-6988 for VIP Las Vegas golf course homes search with a Las Vegas real estate agent. 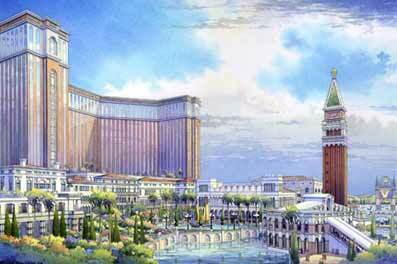 Las Vegas Sands Corp. $2.4 billion Venetian Macau resort grand opening.